On 12 August 2015, the Sindh Assembly unanimously passed a resolution strongly castigating a much reported alarming case of child abuse in Kasur. Explicitly denouncing the utter negligence and apathy of police forces, the resolution demands immediate action against the offenders and their trial in military courts. 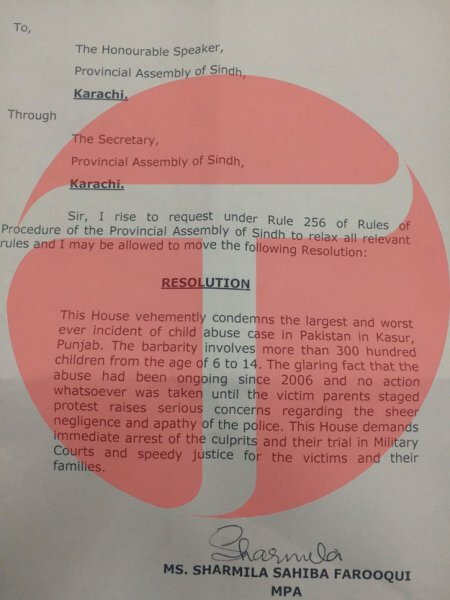 A resolution against the country’s worst incident of child abuse in Kasur was passed unanimously by the Sindh Assembly on Wednesday [12 August 2015]. The resolution demanded an immediate arrest of the culprits and their trial in military courts. The resolution was moved by Pakistan Peoples Party MPA Sharmila Farooqui and was supported by the lawmakers of the Pakistan Muslim League-Functional (PML-F), Pakistan Muslim League-Nawaz (PML-N) and Pakistan Tehreek-e-Insaf (PTI). ‘’The glaring fact that the abuse had been on-going since 2006 and no action whatsoever was taken until the victims’ parents staged protests raises serious concerns regarding the sheer negligence and apathy of the police,” it added.